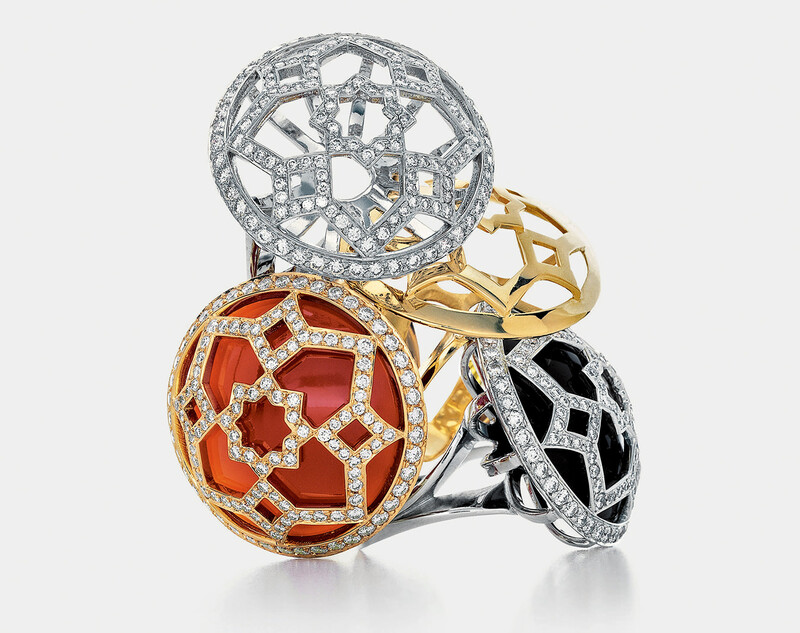 Zellige rings designed by Paloma Picasso for Tiffany & Co. (clockwise from top): 18-karat white gold with diamonds, 18-karat yellow gold, 18-karat white gold with black onyx and diamonds, and 18-karat yellow gold with carnelian and diamonds. 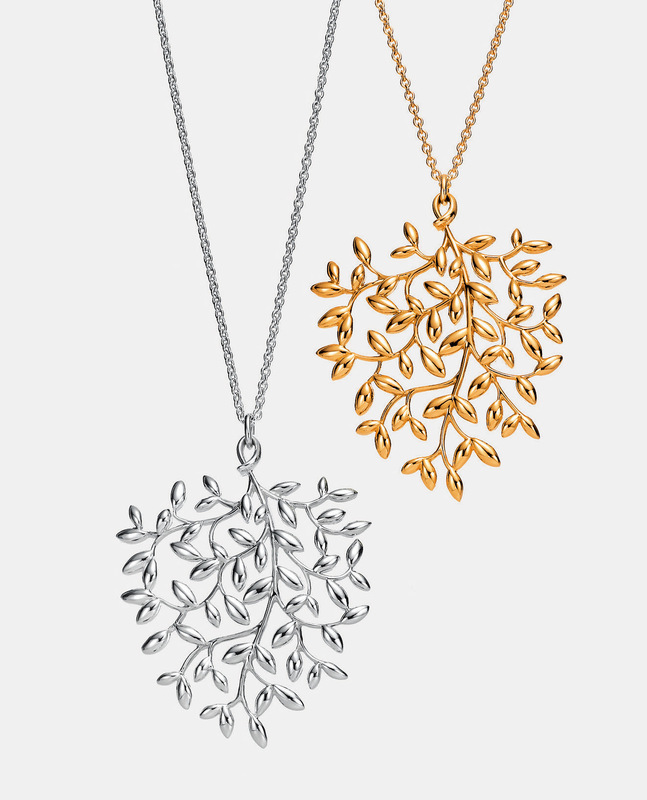 Olive Leaf pendants in sterling silver and 18-karat gold, designed by Paloma Picasso for Tiffany & Co.
20-carat drop earrings in 18-karat gold with yellow quartz, designed by Paloma Picasso for Tiffany & Co.
Jewellery photos ©Tiffany & Co.
Years ago, Paloma Picasso was enjoying lunch with a friend in a New York restaurant when she noticed a woman winking her way. Puzzled, but feeling certain that the woman was not directing the flirty motion toward her, the jewellery designer continued with her conversation. The woman then gave another knowing, conspiratorial wink. “I look at her and realize she’s wearing some earrings of mine, and she wants to tell me that we’re connected,” Picasso says, recalling the tale with a lilting yet robust laugh. For 33 years, Picasso, the youngest child of Spanish painter Pablo Picasso and French artist Françoise Gilot, has inspired such devotion among women. Picasso’s bold, sensual designs and her use of coloured gemstones have resulted in some of Tiffany & Co.’s acclaimed showpieces. Picasso, 63, exudes an easy grace and elegance. She laughs frequently, most often when sharing a story that highlights her own foibles. She is, appropriately enough, accessorized with her namesake jewellery. Her English is fluent, but it carries a mellifluous, soft French accent. She defaults to her native tongue in the rare instances when her English deserts her. Picasso is in a tony Los Angeles hotel suite to showcase Olive Leaf, her 2013 collection for Tiffany & Co. 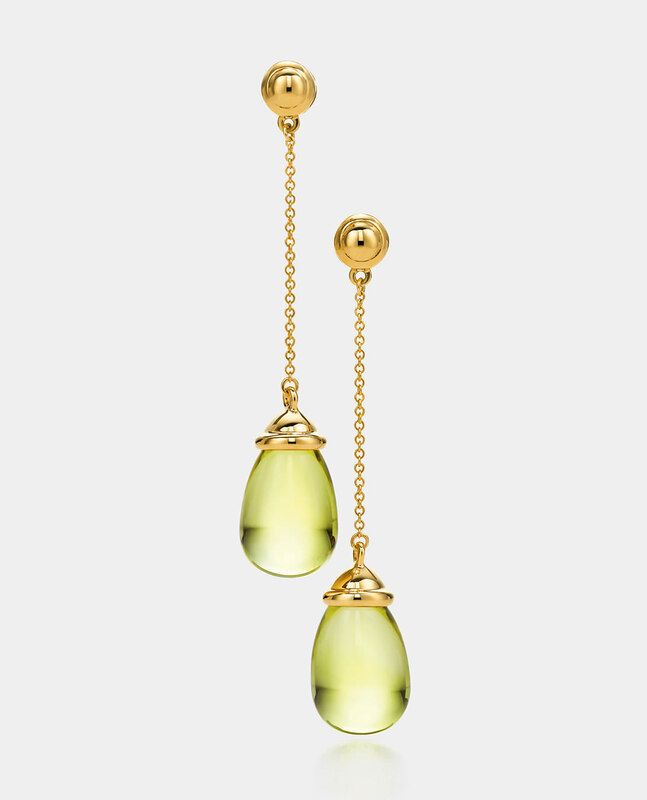 Her offerings were inspired by the olive groves surrounding her home in Marrakesh, and incorporate colourful gemstones such as rubellite, green peridot, and blue topaz. When she looks at the bold design, she still marvels at nature’s handiwork. “To think that the Earth gives us these precious gifts is incredible,” she says. Although she was a self-proclaimed tomboy, the jewellery gave her an inner confidence and a secret joy. “I remember going to school—you were not supposed to wear jewellery,” she says, her voice dropping to a confessional whisper. “But I would accessorize myself discreetly. I would create little necklaces that I wore under my clothes that nobody saw, but would be matching my shoes or matching this or matching that, just for my own pleasure.” The jewellery provided an emotional connection “that was important to me,” Picasso recalls. As the daughter of one of the world’s most famous artists, Picasso didn’t want to be a professional painter, and also felt that following in her father’s footsteps would only lead to inevitably endless comparisons. Something her mother offhandedly said when asked about young Paloma’s artistic path also stuck in her head, and led to a stasis. “My mother would say, ‘Well, all children draw, but only people who are going to become artists keep drawing after 14.’ So somehow this stayed some place in my mind,” she says. “I actually kind of froze when I got to be 14 or 15 years old.” The stoppage was total. She even ceased doodling on her homework. At 16, Picasso experienced the event that would change her life and, more than a decade later, the fortunes of Tiffany & Co.: she met future Tiffany design director John Loring in Venice at Peggy Guggenheim’s house. Not that she made much of an impression on him. “He actually spoke to my mother. I always tell him, ‘You didn’t pay that much attention to me,’ ” she says of the now longtime friend and design director emeritus of the company. Loring came calling in the late seventies. Tiffany & Co. had approached him about the design director job; shortly after he took the position, he asked the young Picasso to join Tiffany’s elite group of name designers, which already included Jean Schlumberger and Elsa Peretti. Her first collection debuted in 1980. In their 33-year history (which includes Tiffany & Co.’s just-celebrated 175th anniversary in 2012), Picasso has created a total of 46 collections for Tiffany & Co., including the likes of Graffiti, with heartfelt words garnishing rings, bracelets, and necklaces; Villa Paloma, a collection brimming with leaf-like latticework and inspired by gardens of the world; and Zellige, with its statement pieces taking cues from Moroccan tiles and age-old mosaic techniques. In their 33-year history (which includes Tiffany & Co.’s just-celebrated 175th anniversary in 2012), Picasso has created a total of 46 collections for Tiffany & Co.
Picasso’s husband, Eric Thévenet, is a doctor of osteopathic medicine by training, but he now runs the business side of her enterprises. (She was previously married to Rafael Lopez-Cambil.) Thévenet helped streamline the operation to Picasso’s jewellery and her eponymous perfume for L’Oréal, dropping the other lines, which included sunglasses, accessories, china and crystal for Villeroy & Boch, wallpaper, and home fabrics. Thévenet travels with her, and they’ve made up a little game to distinguish the journeys: each trip has a theme song. On this month-long outing to America, they had yet to discover their theme, so they trekked to Amoeba Music in Hollywood, one of the last great independent record stores. “Sometimes we leave home with a song, but most of the time, you’re packing and forgetting,” she says. At Amoeba, “We bought, like, 12 records, but we haven’t figured which one is the record of the trip.” Among the purchases were CDs from Tulsa singer-songwriter JJ Cale and seventies glam band T. Rex, but her tastes also run to the more modern and esoteric. Air’sMoon Safari is a particular favourite. The pair maintain homes in Lausanne, Switzerland; on Lake Geneva; and in Morocco. Marrakesh and Venice have inspired two of Picasso’s collections, but she’s declared an end to lines named after specific locales. “Otherwise, I’m going to get calls from New York going, ‘Why? You did this city and didn’t do New York?’ So I thought, uh oh, this could be dangerous,” she says with a smile. 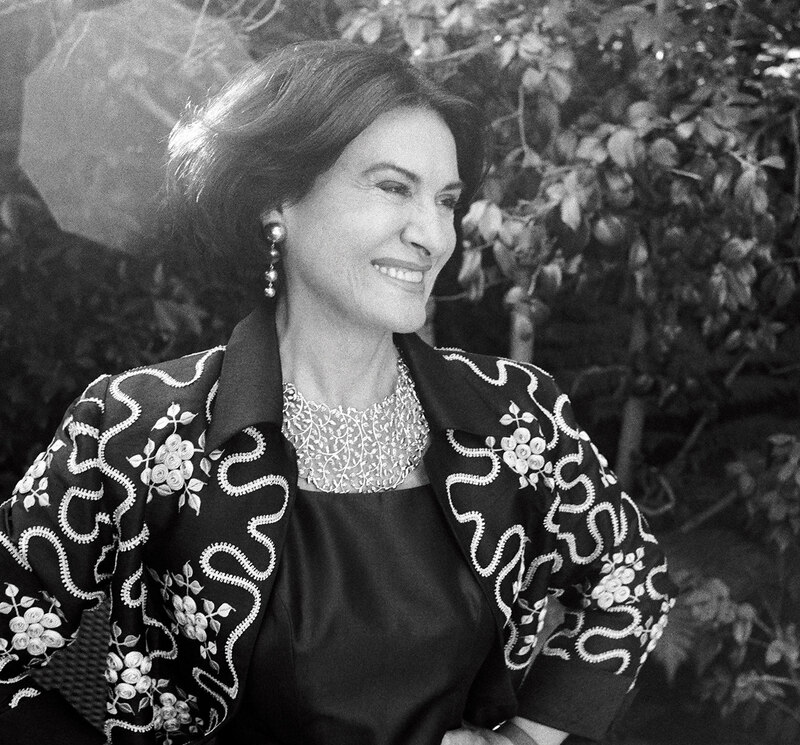 Though she’s still recognized, Picasso doesn’t miss the days when her face, with her dramatic eye makeup and fierce red lips, peered out of every magazine and bus stop in the advertisements for her tremendously popular perfume, Paloma Picasso, which she introduced in 1984. 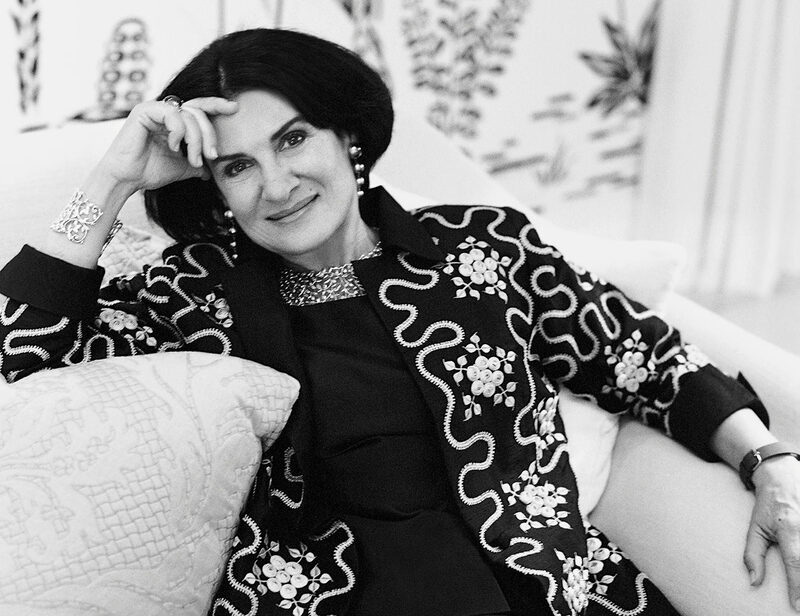 These days, Paloma Picasso seems content to let her designs represent her, inspired as always by the movement of the jewellery and how her pieces work in harmony with the wearer, never in opposition. No detail is too small.